Pokeweed (Phytolacca americana) is a large, perennial, shrub in the Phytolaccaceae or pokeweed family. 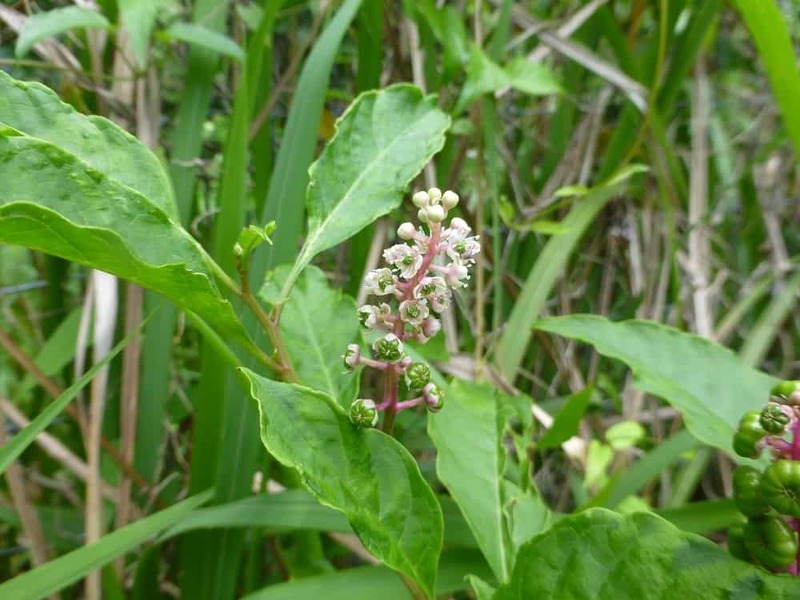 It has many common names including poke salad, poke sallet, pokeberry, inkberry, poke, pocan, coakum, Virginia poke, poke root, scoke, pigeon berry, garget, cancer jalep, and chui xu shang lu (in Chinese medicine). It is native to the eastern Unites States and can grow to a height of approximately 15 feet and just about as wide. The mature plant is usually multi-trunked, but may grow as a single stalk. The stems are a brilliant purple color. It occurs naturally in disturbed sites and fence rows from Maine to Florida and Texas. Its natural habitats are thickets, roadsides, fields, and disturbed sites. The leaves are alternate, petioled, oblong to lance shaped and tapering at both ends. The stems and stalks become red as the plant matures. The flowers are small and lack petals, however the sepals resemble petals and are white, tinted pink along the edges. The center is green. They are found on racemes that are from 2 to 8 inches in length. The flowers attract many pollinators, and consequently attract insect eating birds. Flower production is at its peak in the spring and summer, however, flowers occur long into the fall when the plant is covered with maturing fruit. Though pokeweed is considered a nuisance weed by many I consider it an amazing plant. It is an incredible source of food for a wide variety of wildlife. The flowers provide a nectar source for bees, wasps, and butterflies, and the fruit and flower buds provide a food source for a variety of birds. Foxes, opossums, raccoons, and field mice also eat the fruit. It is by far the most frequently visited shrub in my landscape and property. Wildlife of all sorts can be seen at any given time reaping the benefits the pokeweed provides. The cardinals in my yard visit it daily to eat flower buds and fruit, and the Carolina wrens scour it for insects. I am always happy to have this ‘free’ plant in my landscape; it requires no maintenance; comes back year after year without replanting or seeding; provides the wildlife a food source all year long, and is always a source of entertainment for the wildlife watcher and photographer that I am. The vegetation is also a larval food for the southern army moth (Persectania ewingii). 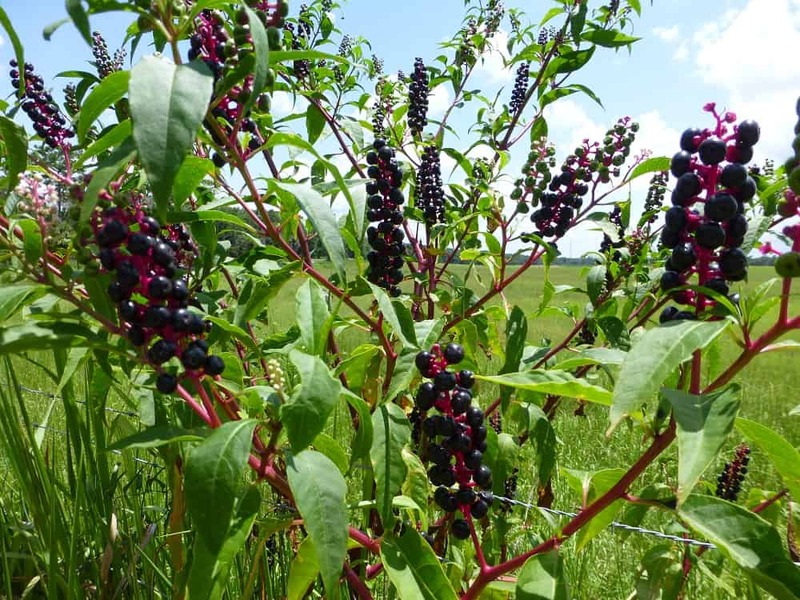 Pokeweed has a long history of use as food, medicine, and dye for cloth. It is quite striking in the landscape with its bright red stems and stalks, white flowers and deep purple berries. It is rather large and will probably not do in a tidy flowerbed and is probably used best along the edge of a woodland area or as a specimen planting. The stalks are brittle and larger specimens should be staked to prevent collapse during heavy rains, and or the weight of the berries and birds. A large plant of mine is tied to a fence and is staked well enough to withstand the weight of a pileated woodpecker that stops by to eat berries once a week or so. Pokeweed will freeze to the ground each year, but will come back from the roots in the spring. The plant will freeze and turn brown but if there are any fruit left on it should be allowed to remain until the birds consume the remainder. It may not look very attractive, but during the winter the dried pokeberries are an important food source for birds. The dead stalks can be removed once all the berries have been consumed or as the new growth appears from the root in the spring. Transplanting is by far the easiest means of propagation, however seeds will propagate readily … or one can look for volunteers left by the birds. I certainly can’t ask much more of a plant … I don’t have to buy it, pamper it, feed it, or even water it. It transplants well at any stage. The root is a large, brownish, bulb that resembles a sweet potato. 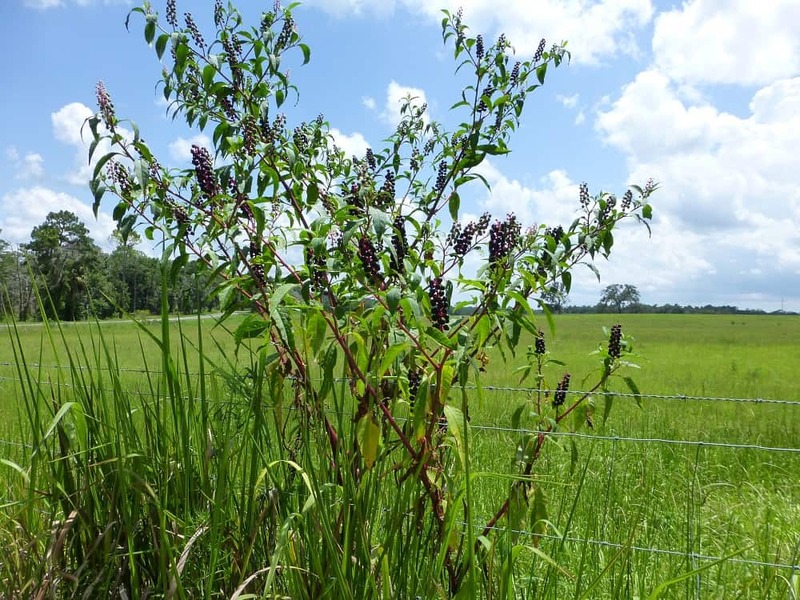 Pokeweed is toxic to horses and cattle. All parts of the plant are considered poisonous although many people eat, cooked, immature green shoots when they are 4 -6 inches tall. Recipes call for boiling the immature stems and leaves in several changes of water. The plant becomes more toxic as it matures and the stem becomes reddish purple.